Sentient Inception was born during the discussions that Paul and I have documented in our upcoming book: Ready to Launch? Becoming an Entrepreneur in Australia. 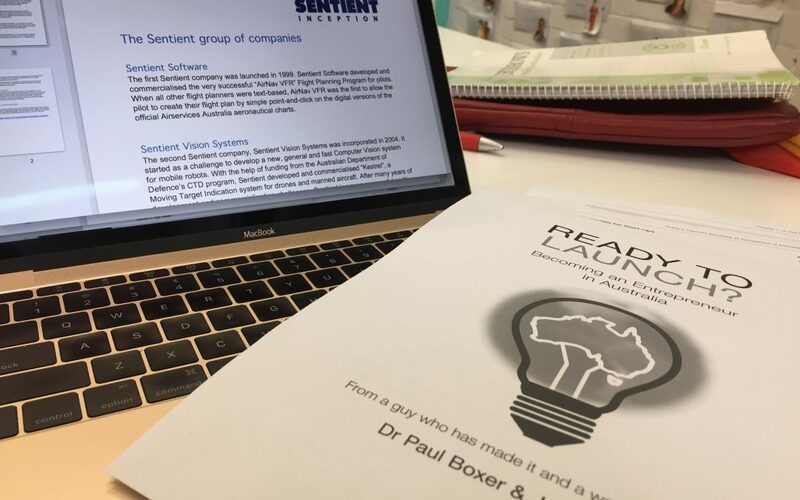 The book is packed with practical information and interesting stories from Paul’s hard earned knowledge as a successful disruptive global tech entrepreneur in Australia. It also includes the explanation of the elements of our quiz, which gives you a quick assessment whether YOU are Ready to Launch! Of course we recommend working closely with a mentor to fully make this evaluation and if you are ready: APPLY to our Incubator. We are in the final stages of producing the book and look forward to releasing it this year (physical and eBook format). All the information in it is obviously useful, but we know that things are changing fast in the world of startups in Australia, so this blog is where we are helping you keep on top of the stuff that isn’t in the book. If you can’t wait for the official release, get in touch with me for an advance copy!